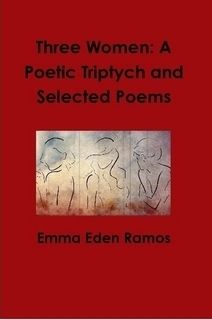 I recently had the pleasure of reading and reviewing Emma Eden Ramos‘ first chapbook, Three Women: A Poetic Triptych and Selected Poems at the beginning of November. Her collection creates three unique female voices who are connected. I had the pleasure of interviewing Emma via email to learn a little more about her as a poet and her collection. Without further ado, please welcome her. 1. How would you introduce yourself to a crowded room eager to hang on your every word? Are you just a poet, what else should people know about you? I’m pretty shy and self-conscious in front of large groups of people, so I would probably begin with a short anecdote as a way to personally connect with the crowd. From there, I would go into my background. I am a twenty-four-year-old student from New York City. I’ve wanted to be a writer since I was about seven-years-old. That year I wrote my first short story, a fable, which ended up in a collection of children’s stories called Witches Brew. I became interested in poetry later when my mother gave me a collection of Emily Dickinson‘s poems in my freshman year of high school. That was a rough year and I remember finding a great deal of solace in Dickinson’s words. I wrote my first poem that year, a poem about the main character from Edith Wharton‘s novel Summer. My English teacher was very supportive and encouraged me to continue writing. I did, on and off, until 2009 when I decided to take my writing more seriously. I wrote a novelette entitled Where The Children Play that was published in the Spring of 2010. I’ve been writing continuously ever since. 2. How did you create the three women in your chapbook, Three Women: A Poetic Triptych and Selected Poems? Were they based upon people you know or yourself? After I agreed to write a poetry chapbook, I grew nervous. though I have a deep love for poetry, I see myself as more of a fiction writer. Creating and developing characters is essential to my writing process. I need them as guides. With Three Women I was lucky because, though the editor of Heavy Hands Ink had never published a chapbook with a storyline and characters before, he was supportive of the idea. When developing the three characters, I attached each woman to a certain female archetype from Greek Mythology. I saw Annette as a manifestation of Aphrodite. She is outwardly beautiful and has relied on her beauty throughout her life. However, after her son’s suicide, Annette’s physical “perfection” has become more of a handicap. The beauty she once treasured now fully masks Annette’s internal torment. I saw Julia as Persephone. She is the daughter trapped in the Underworld, which in her case, is adolescence. However, Julia is also very much based on myself. Milena is a warrior. I have met many women like her and am always floored by their resilience. As an archetype, I saw her as Athena. Milena possesses courage, intelligence, wisdom, and strength. She may be under Annette’s “professional” care, but she is not the one who is lacking in emotional resources. 3. Do you see spoken word, performance, or written poetry as more powerful or powerful in different ways and why? Also, do you believe that writing can be an equalizer to help humanity become more tolerant or collaborative? Why or why not? I love spoken word and performance poetry and am a fan of artists such as Ursula Rucker and Anne Waldman. There is a power, an electricity, that comes from experiencing a poem performed. Initially, I think performance poetry is probably more powerful than written poetry because it is synesthetic. There is a hidden quality to the written word, however, that I think makes it more durable. When I read a poem, the words are locked in my consciousness in a very different way than when I hear a poem performed. I do believe that writing can be an equalizer, a tool through which human beings can find a common ground. Writing is a form of communication. Thoughts and perhaps, more importantly, feelings are channeled and conveyed through writing. While individuals are different, as a collective we share feelings that are fundamental to the human condition. Writing–poetry, fiction, non-fiction–can and has been a medium through which those universal feelings are expressed. When I hear people say that they struggle with this or that poem, find it impenetrable, I often agree. I cannot count the number of occasions that I have finished reading a poem and thought, “Wow. Beautiful language. Beautiful imagery. If only I knew what the writer was talking about.” I don’t know why this is. I have heard poets argue that poetry is personal. It comes from an unconscious place and therefor can only be understood by the poet. I respect this answer and the artist’s desire for self-expression. However, as I said earlier, writing, poetry included, has the potential to be a tool for communication. 5. Please share some of your favorite contemporary and classic poets and a favorite collection or two from those poets and why you enjoy their work. One of my favorite contemporary poets is a woman named Brooke Axtell. I discovered Brooke when I came across her first poetry collection, Daughter of the Burning. This collection, as well as Axtell’s other work, is a perfect example of the power poetry has to communicate strong emotions and inspiration. Other poets I love are Adrienne Rich, Patricia Smith, Linda Gregg, Sarah Hannah, Sharon Olds, and the list could go on. Thanks so much Emma for answering my questions. I wish you great success in your poetry. I have seen this book on another blog. It looks good but Im worried it may be very sad. Was worried but this interview is wonderful. Is it worth reading? I know it involves suicide. There is more hope in this collection’s triptych than you’d expect. I really enjoyed it and was not overly sad. I would check it out if you’re interested in it. Great interview! I often find myself doing the same thing, thinking that a poem is beautiful but wishing I knew what it meant. 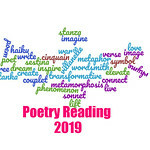 I think that poetry requires a greater attention from readers since words are often chosen for a specific purpose which relates to the nature of the form — it has limited space in which to tell readers about something. No speed reading there. Thank you so much for introducing me to Emma and her works. I enjoyed this interview and will add her collection to my list! I hope you enjoy the book. It has really inspired me to get a move on putting together my own poetry collection.